This white paper was prepared by the participants of the fall 2017 long program Complex High-Dimensional Energy Landscapes. Recent advances in computational resources and the development of high-throughput frameworks enable the efficient sampling of complicated multivariate functions. This includes energy and electronic property landscapes of inorganic, organic, biomolecular, and hybrid materials and functional nanostructures. Combined with new developments in data science, this leads to a rapidly growing need for numerical methods and a fundamental mathematical understanding of efficient sampling approaches, optimization techniques, hierarchical surrogate models, coarse-graining techniques, and methods for uncertainty quantification. The complexity of these energy and property landscapes originates from their simultaneous dependence on discrete degrees of freedom – i.e., number of atoms and species types – and continuous ones – i.e., position of atoms. Moreover, dynamical behavior governed by complex landscapes involves a rich hierarchy of timescales and is characterized by rare events that often are key to understanding the function of the materials under investigation. 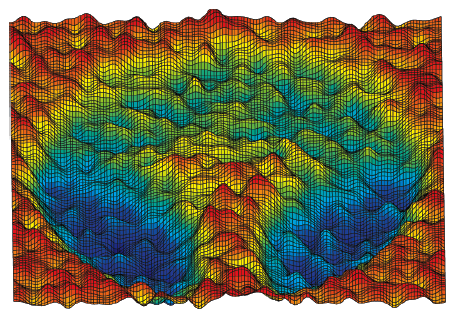 To make significant advances in the crucial field of complex energy landscapes, we identify scientific and mathematical challenges whose solutions impact fields spanning from machine learning to materials science and chemistry to large-scale computational simulation. This potential impact includes the discovery of new materials with novel properties, enabling simulations across increasingly larger length and time scales, and finding new physical and chemistry principles that guide how materials work. It also offers the potential for innovative insights into how complex machine learning models interpolate data and identify patterns, and to develop new methodologies describing uncertainty in computational models and efficiently propagating that uncertainty through different models and scales. We identify a range of key issues in the field, along with promising directions to make significant progress.